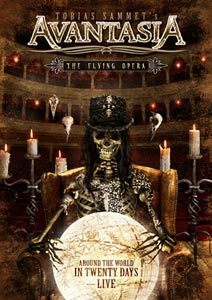 Limited four disc (two CDs + two DVDs) live release from this Metal project created by Edguy's Tobias Sammet. This comprehensive collection highlights Avantasia's highly memorable first world tour that followed The Scarecrow's international success. The tour included a headlining spot at the biggest Metal festival in the world, Wacken Open Air Festival (audience of 85k) and the Masters of Rock Festival in the Czech Republic, as well as shows in Asia, South America and all over Europe in front of more than 500,000 people. 20 Where Do We Go From Here?